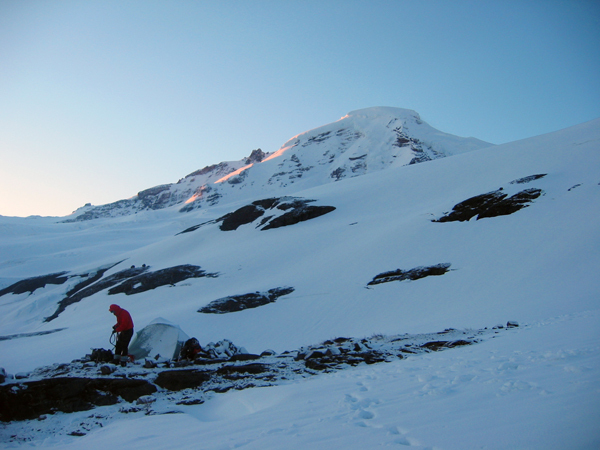 Mount Baker in a day - 6 hrs 45 min to the summit, 4 hours 40 minutes back to the car. 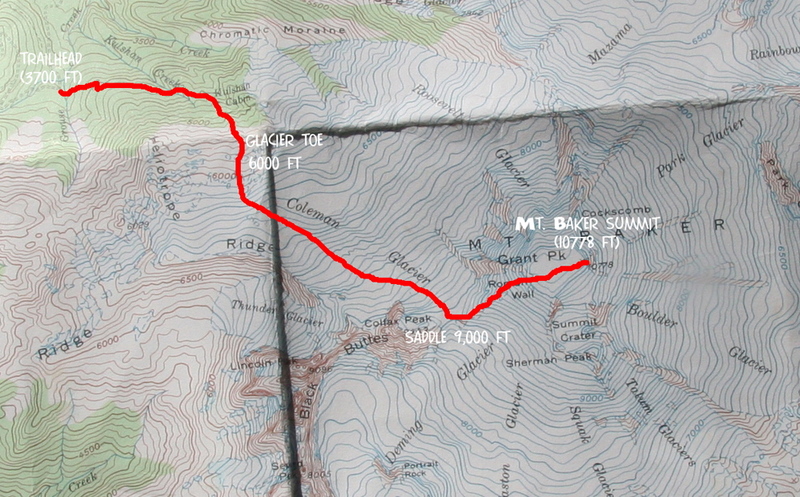 Left: Map of the Coleman-Deming climbing route of Baker. (Click on image to enlarge.) Right: The summit cone of Baker and a typical crevasse. 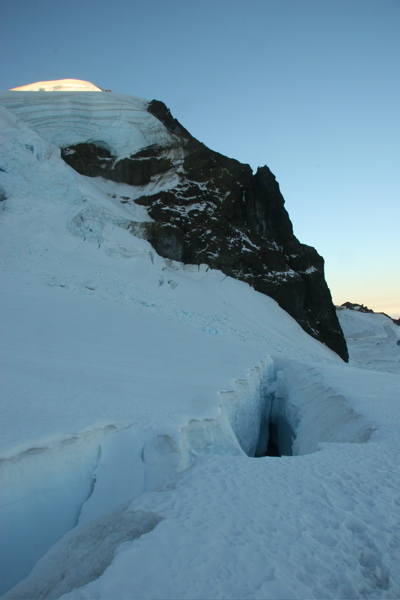 Since we climbed in late summer, there were many small to large crevasses, but we always found a way to weave around them or cross them on snowbridges (or step over them if small enough). One of the peaks on my to-climb list this summer was Mount Baker, the snowy volcano I see practically every day from my neighborhood. I had climbed Baker with my parents and sister back in June 2004, and wanted to climb it again, only this time in late summer. In late summer the climb is much more varied: instead of being a snow slog, there are plenty of crevasses, bare glacier ice, and pumice slopes, making climbing and route finding more interesting. 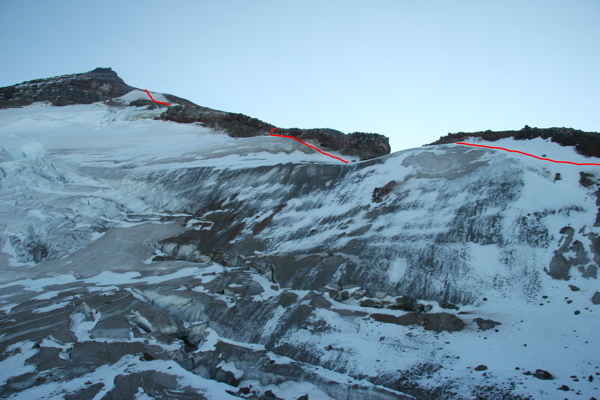 When I saw a Sept 7 climbing report warning that the Coleman-Deming route on Baker was basically out of climbing condition (open crevasses, ice, etc), I knew that it was the perfect time to climb! So Sept 30, my friend Jason and I headed up the Heliotrope Ridge trail for a 1-day attempt of the climb. It took us 6 hours, 45 minutes to climb the 7,000 ft to the summit. The descent was even quicker (4 hours, 40 minutes), for a total climbing time of 11 hours, 25 minutes. We had given ourselves plenty of time, so we were back at the car quite early. Overall, the conditions were much better than we had expected. 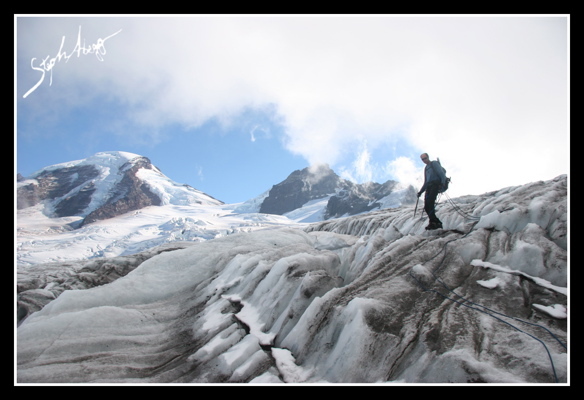 There was plenty of glacier ice and many crevasses to either cross or weave around, but the climb was quite doable with only crampons and a single ice axe (Jason was wearing running shoes with his crampons!). It is a great climb to do in a day! 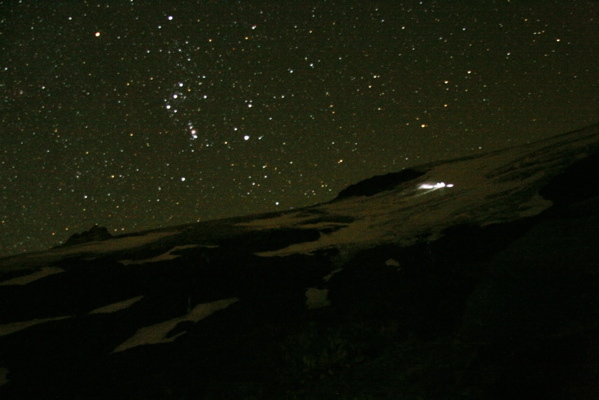 Five climbers on the lower Coleman Glacier, a late-summer Orion in the sky. This was the only other party of climbers on the route. 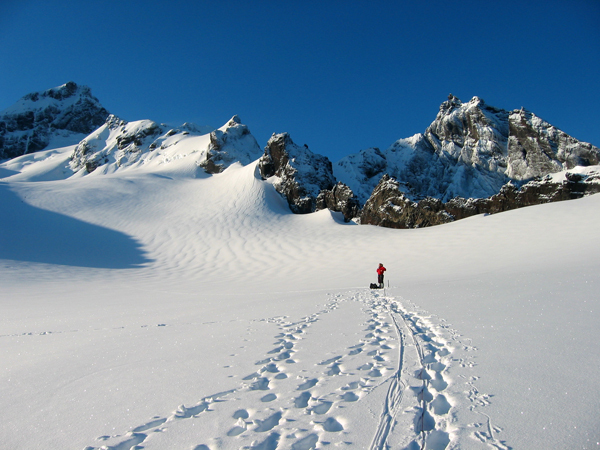 We hopped on the toe of the Coleman Glacier at around 6,000ft, a bit beyond the campsites on Heliotrope Ridge. Jason coming down the lower Coleman Glacier on the descent (at this point on the ascent it was still dark). 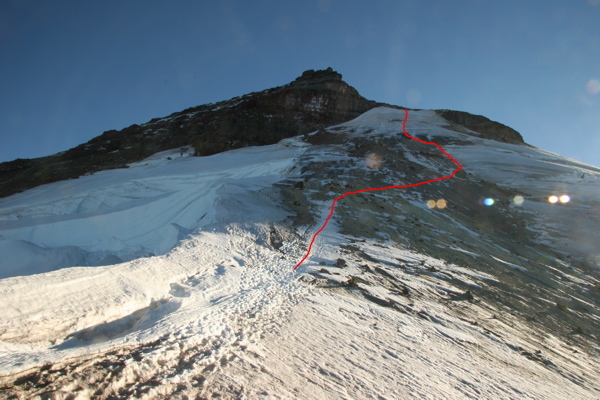 There was no snow cover on the glacier, but we managed to weave a line through it relatively easily, even in the dark. This photo was taken from the lower Coleman Glacier on the descent (at this point on the ascent it was still dark). 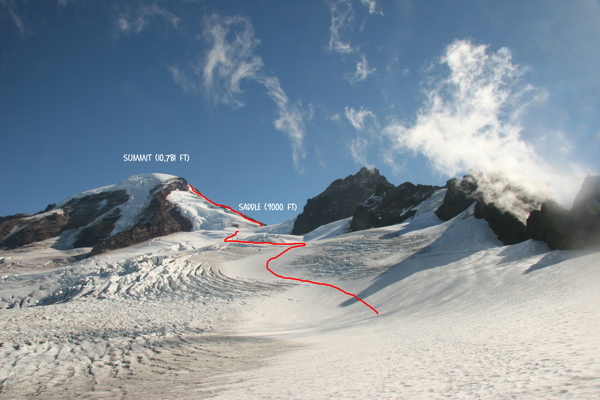 The route ascends the Coleman Glacier S and SE toward the Black Buttes (on right in the photo) and then bears toward the broad ice saddle (9,000 ft) between the East Butte (Colfax Peak) and the summit cone. From the saddle we ascended the pumice ridge and then climbed the steep ice/snow right of the Roman Wall, which brought us to a flat traverse to the summit (you cannot see the summit in this photo). Compare the above photos with these photos of the summit cone and camp in June 2004 and the Black Buttes in June 2004. No open crevasses or ice on the Coleman Glacier in June! The Black Buttes from the mid-Coleman Glacier. Finally, it was light enough that we could turn off our headlights (the sun rises late this time of the summer—around 7:10am). 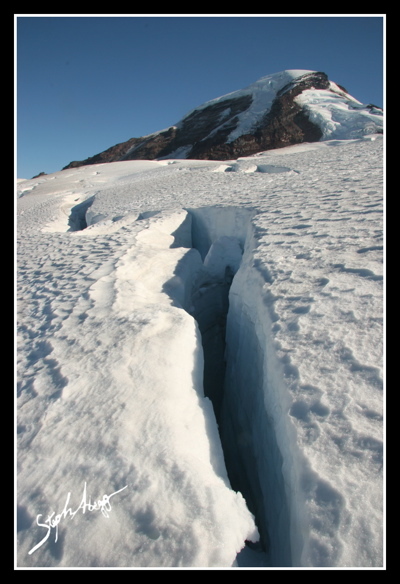 For the most part, we were always able to find an easy way to weave around crevasses or cross on snowbridges, like the one shown in the photo. On the climb up the Coleman Glacier to the saddle, there was one large crevasse that extended all the way across, with a single snowbridge. 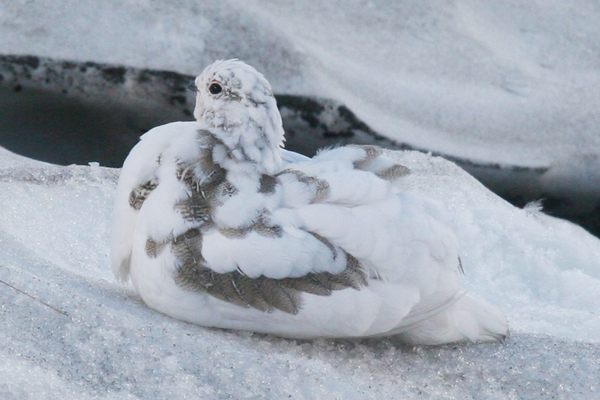 If this snowbirdge had not been there we would have had to jump a 5-foot-wide chasm…. 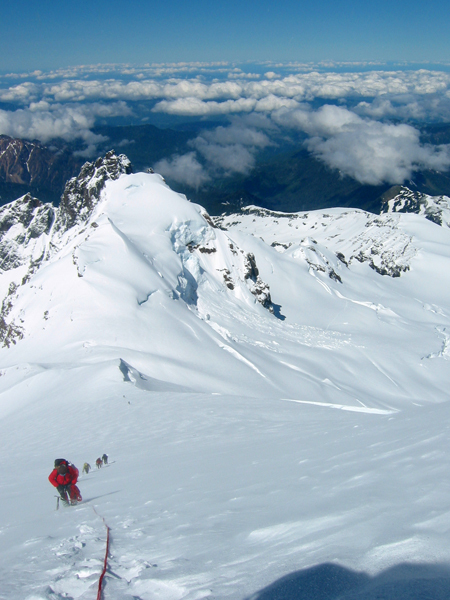 After arriving at the saddle, the route ascends about 300 ft up the pumice ridge to the east. A lot of this is on a boot-beaten trail. Compare the above photos to one I took while ascending this steep slope in June 2004. Lots more snow in June! The summit, 10,781 ft. 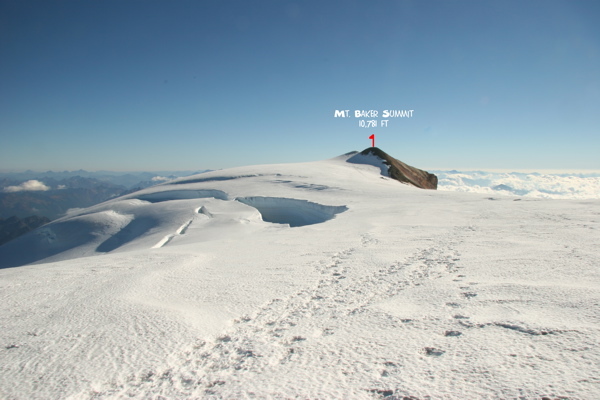 Above the Roman Wall, the gradient lessens and after a few minutes brings you to a flat snowfield between the old crater and the true summit. It takes about 10 minutes to cross this flat expanse to the summit. It was very windy up here! 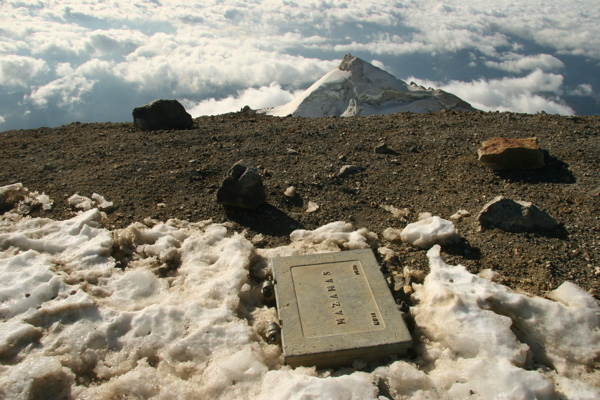 The summit register. It was so windy on the summit we had to crawl to the top! Overall, this was a great end-of-summer climb! Thanks Jason for being a fun climbing partner.